Karen Vosen was a student in a Center Medallion Class I taught in Havre, MT. Here is the story of her quilt. 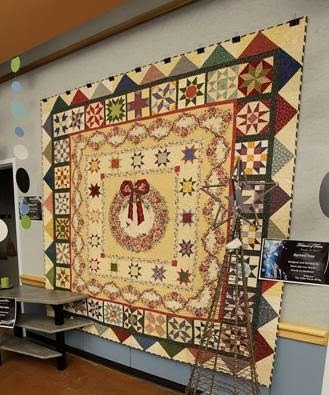 For several years now, quilter Karen Vosen has donated a quilt to the Boys & Girls Club of the Hi-Line to be auctioned at their annual gala event, the Festival of Trees. The donation has typically raised between $1000-$2500, but in 2013 something very special happened. The Club ran a different sort of auction – a reverse pledge auction, in which the highest bidders pledged first, and then the auctioneer worked his way down to the lowest pledges. Every pledge came with a chance to win the quilt. Inspired by a moving alumni presentation and the hope of winning the beautiful quilt, 60 event attendees pledged a total of $64,500, which will be paid over the next three years to help fund the Club’s building expansion. And the news gets even better: the Club received a challenge grant that will double every dollar raised in the auction, bringing the total raised to $129,000!